Provide comfort for the family of Russell Newell with a meaningful gesture of sympathy. 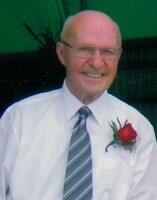 Passed away peacefully on March 14, 2019 in his 91st year with his beloved wife Doris (Jamieson) of 68 years by his side. Loved Dad of Annette Owens (Rob) and Gail Greer (Kevin). Proud Grampa of Ryan (Lisa), Ayla, Cody (Charlotte), Melissa (Kirk), Matthew (Cindy) and Jenna (Jesse). Great Grampa to Payton, Cameron, Gracelynne and Jaxon. Predeceased by Son Gary, Son-in-Law Donnie Rogers and Granddaughter Amanda. He will be sadly missed by his Daughter-in-Law Margo (Wayne), Brother Doug Newell and Sister-in-Law Eileen Anderson along with his many nieces, nephews, friends and neighbours. Visitation will be held at the Drury Funeral Centre 519 Victoria St. E., Alliston from 2-4 and 7-9 p.m. on Friday, March 22 with service in the chapel at 11 a.m. on Saturday March 23. A reception will follow at the funeral centre followed by a family interment at Mansfield Presbyterian Cemetery. If so desired memorial donations to the Mansfield Presbyterian Cemetery or Matthews House Hospice would be appreciated. The Newell family wish to extend their heartfelt thanks to the staff at Good Samaritan Seniors Living for the compassionate care and attention shown to Russell during his stay. Provide comfort for the family of Russell Newell by sending flowers. Doris, Annette & Rob, Gail & Kevin and Family We send you all our deepest sympathy. You are in our thoughts and prayers. Sorry to hear of your passing. Your zest for life lives on though your children and grandchildren.